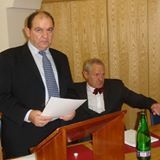 5] Today, after his honour judge NEIL BIDDER QC had my MAPPA registration quashed just days before the T20097455 notorious “machine gun” trial, the Appellant has become aware he is again registered MAPPA Level 3 Cat. 3 BUT NOONE WILL EXPLAIN WHY? 2] I was “set up”, following my letter to H.R.H. Prince of Wales in 2009 to be shot to stop civil proceedings. 5] Are you prepared to intervene when even aware, as my MP, of this repeat behaviour from the last time I was gaoled for the very same reason? 3] At last! see my Offender Manager who, in turn with every other conceivable unit so far contacted “cannot ” identify my MAPPA status when and why changed or allow me even a table or chair in my cell, unlike others still currently without a single stick of furniture except for a tv shelf! 7] It is now 2 months since I paid out £20-odd thousand to 4 different law firms to expedite urgent matters and attend “sentencing”. Not a word either from ICFO3361 “MACHINE GUN CLAIM” asking for direct court intervention on it and ICFO3546 N.H.S. MILLION POUND claim. 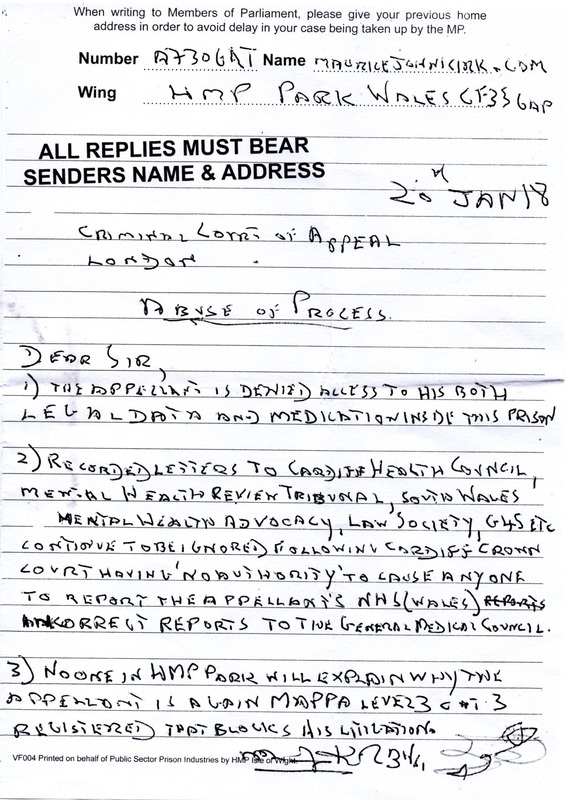 Not a word from the 3 law firms “Mental Health Review Tribunal”, GMC, S. Wales Mental Health Advocacy, IMB, NHS [Wales], or specified doctors written to in Caswell Clinic where the 1983 M.H.A. abuse happened. Not one helper in my M/G, MAPPA or civil claim conspiracies are allowed to be contacted by telephone except brother, sister utterly bemused that such conditions can be repeatedly inflicted on an Englishman so stupid, in the first place, to come and practice vetinerary science in such an inherently corrupt environment – and noone seems to give a damn about it!! 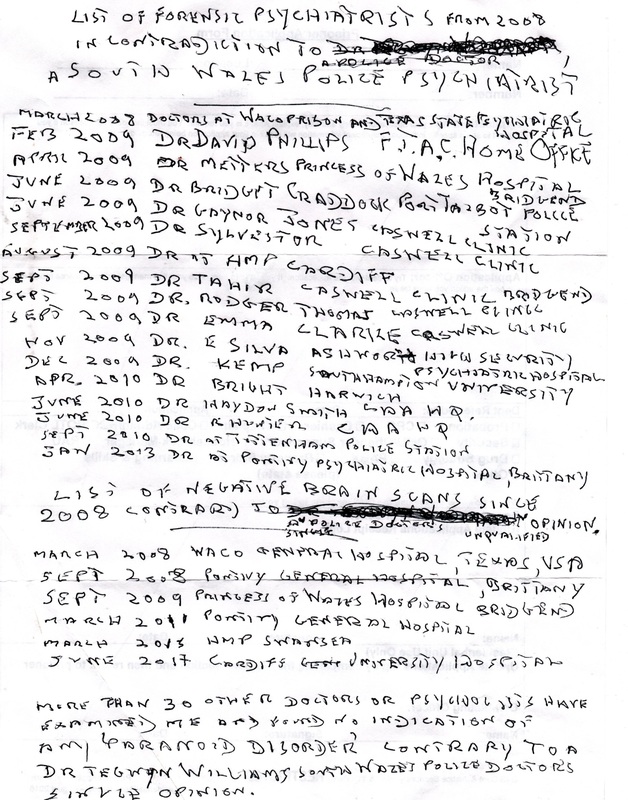 “March 2008 – Dotors at WACO PRISON, and TEXAS STATE PSYCHIATRIC HOSPITAL…continues..
1] my prescribed medicines for weeks on end? 2] the reason why my Cardiff Hospital appointment cancelled for the 3rd time? 4] Library access -> BOTH FIRST APPROVED AND THEN STOPPED? 5] Free letters to courts, MP, GP, witnesses, Dr. Nick Hardwick, or Litigants In Person? 8] Reason not allowed Ministry of Justice laptop only for it to be countermanded as a “forced to be Litigant In Person”? when diagnosed with “significant brain damage due to a possible brain tumour”? 10] When not even Cardiff Crown Court has authority to report all this to the GMC? 11] OMU [Offender Management Unit] or IMB [Independant Monitoring Board] intervention due to MAPPA? 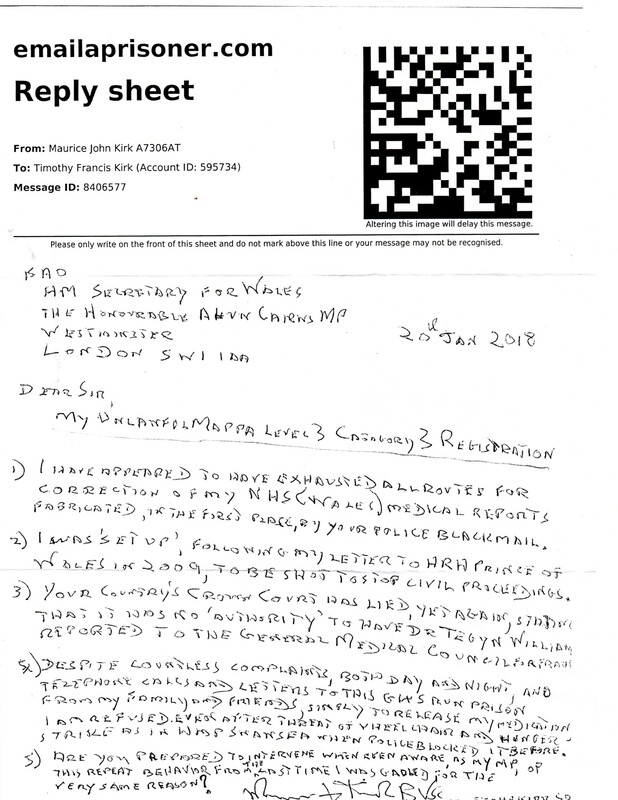 2] I am unlawfully gaoled as Cardiff Crown Court state it has NO AUTHORITY to have my Soiuth Wales Police MAPPA 3 Catagory 3 medical reports, fabricated due their failed malicious prosecutions, referred to the General Medicsal Council. 5] Where is landing box and forms on B4 Wing incidentally? 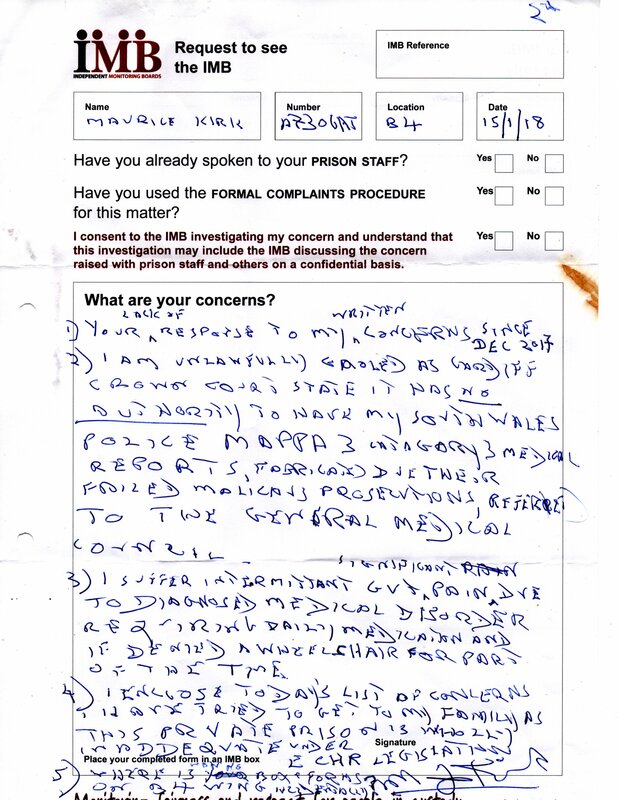 1] Despite 12+ applications to hand out my property from prison, not only was I refused, I was denied the booked visit to discuss urgent medical matters with brother Tim. 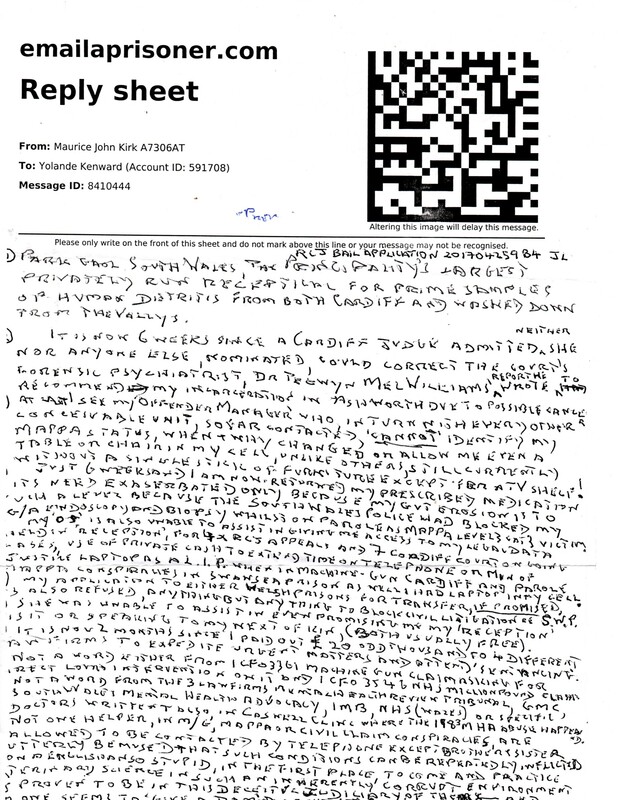 3] Closer examimnation of South Wales Police forensic records confirm only their chief psychiatrist, Dr. T W in his 18th October 2009 report in paragraph nrs. 32 to 40 warns of my possible “risk” but that of my supporters! 9] Not just the Mental Health Review for Wales and the Mental Health Council ignore my cry for help but the Australian and New Zealand Psychiatrist Soc. ignore. 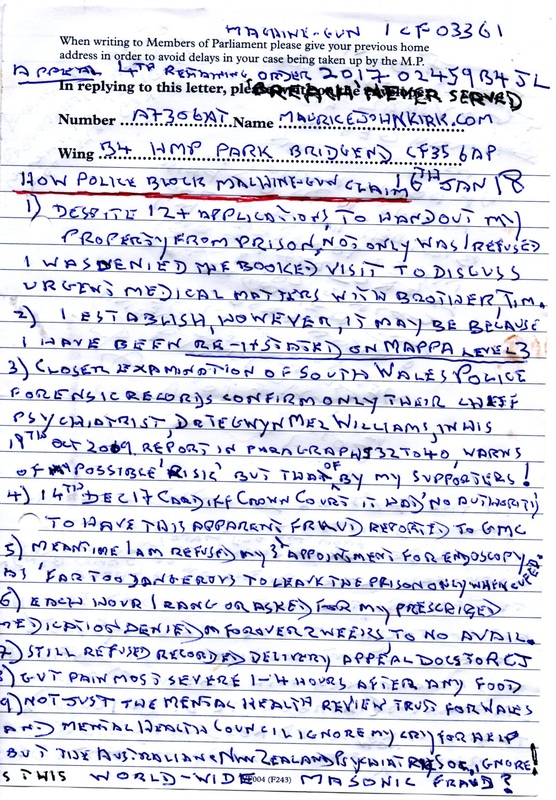 The ourageous hostilities against Maurice Kirk continue during his stay in HMP Parc, Bridgend – he is still denied vital medication for no conceivable reason, the medication already prescribed to him before he entered prison. 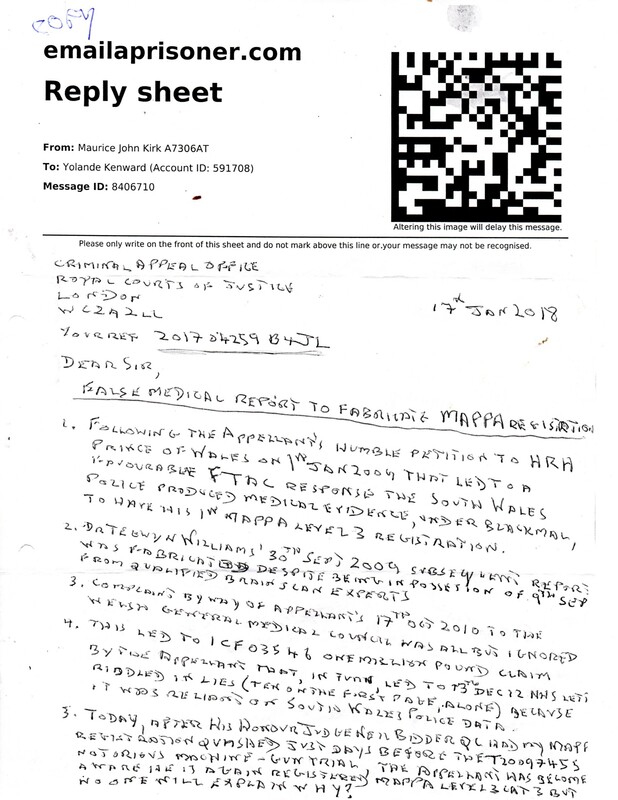 Prearranged hospital appointments are also denied, as they’ve reinstated the ludicrous allocating of him being a “MAPPA Level 3” subject – Maurice is not and has never been violent, for starters, he was a vetinerary surgeon in the past, before they removed his career from him out of blind persecution, who cared for animals and the allegation that he visited a certain doctor’s home, this doctor responsible for so much grief in Maurice’s life [at the behest of certain neer-do-wells, very questionably in positions of authority in Wales] with intent to do whatever – is a completely unfounded lie made by certain authorities to add weight to their nonsensical targeting of him, going back a long time. Perhaps these characters still can’t get over the fact that Maurice was acquitted in 2009 regarding charges put upon him relating to the “machine gun case” where the prosecution went so far as to paint the machine gun in question a completely different colour in order to mislead the court, before painting it back to its original colour after the case was found in an acquittal for Maurice – and rightly so! The antique gun had been removed from an airplane Maurice had purchased 2 years earlier, that didn’t even work – the plane nor the gun. As a desperate resort, the allegation was made also at the time that Maurice had a “brain tumour” – a complete lie that was proven to be via a bona-fide NHS hospital report they tried to keep from Maurice until he went on hunger strike in 2013. This stuff is very dark!! How does the prison governor justify the blatant outrages of Maurice being denied vital medicines, and a visit to a hospital? 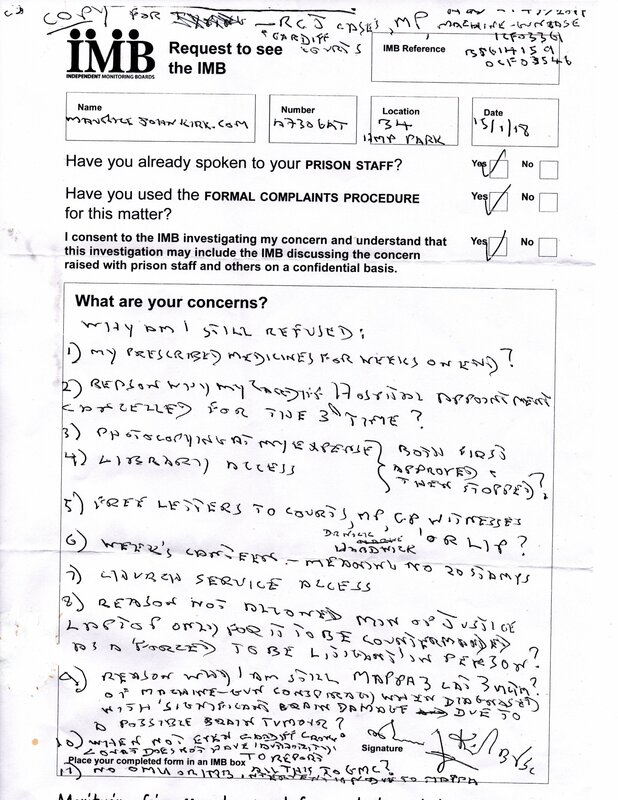 Why does he not respond to letters of complaint sent by both Maurice and also supporters regarding this completely unacceptable behavior by the prison? As a public servant shouldn’t he be doing his job properly? After all, he swore to care for all convicts in his care when taking the role of Governor. Why shouldn’t he and all the other miscreants disobeying the laws in place be not only removed from their respective employments, but prosecuted under the Human Rights Act, amongst other statutes? The question has been asked “Are they trying to kill Maurice?” – and the question seems a perfectly valid one. These people are cruel beyond belief! Maurice’s brother travelled 200 miles this week to try and retrieve legal documents for Maurice but was refused entry onto the prison premises!! Unbelievable!! Is this worldwide masonic fraud? “Please read and spread the word about the tortures M has endured. He is currently in HMP Parc and has been denied his medicine since admitted. (Mid Dec 17) He cannot sleep for internal pains at night and so forgoes certain meal times in the hope of a good sleep. He is constantly asking for his prescription but continually denied. Are they trying to kill him whilst there? 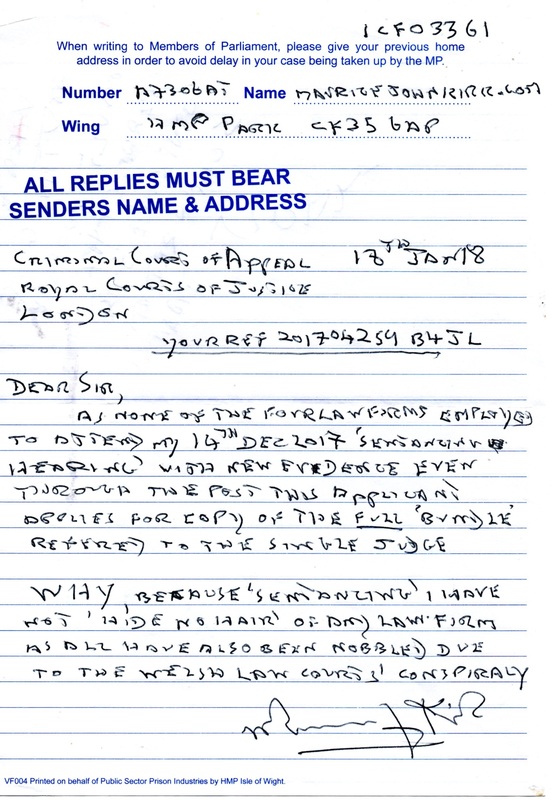 I enclose letters he has written (which I typed out) and one from the lawyers dated 13Dec12 which contain at least ten falsehoods as he never went near the doctor’s house as he has never had an inkling where the man lived!